Race differences in intelligence: how research changed my mind to overcome the “all races are equal” dogma. I grew up indoctrinated by political correctness. Like a large part of citizens in Western countries I was brainwashed: Races do not exist, all are equal. Saying anything different, saying that there are racial differences, is racism, a crime. In school I heard disparaging remarks about Artur Jensen and other “unscientific” “dishonest” “cheating” scientists doing faulty research about race differences. The Bell Curve by Richard Herrnstein and Charles Murray actually looked fairly convincing to me, but if even President Bill Clinton denounced it, there must be something wrong about it. My opinion changed when I read about trans-racial adoption studies. That was the last drop that really disproved all these desperate attempts to explain away racial differences in intelligence. Chart 9 summarizes the results for Oriental children adopted into White middle-class homes. 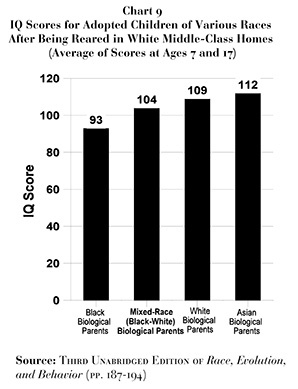 In plain English: adopted Asian babies grew up to be very bright, adopted black babies grew up to have low intelligence. Author Posted on November 18, 2009 October 13, 2012 Categories Race & IntelligenceTags adoption studies, bell curve, controversial topics, genetic basis, race iq, racial differences382 Comments on Race differences in intelligence: how research changed my mind to overcome the “all races are equal” dogma. Political correctness going overboard. It just so happens that suicide bombers rarely are blonde white old ladies. But it violates civil rights when black, Arab or Asian muslim males are singled out as terrorist subjects. He accused the police of wasting time and money by carrying out “self-evidently unmerited searches”, which were also an invasion of civil liberties. The searches, for example, of blonde women who fit no terrorist profile came against a backdrop of complaints from rights groups that the number of black and Muslim people being stopped and searched by police was disproportionate. Lord Carlile said that police were stopping white people unjustifiably so that official figures would make it look as if they were not singling out black and Asian people under Section 44 of the Terrorism Act 2000. “No police officer has admitted that to me, but I believe that is the case,” he told The Times. Of course, there is another human rights problem. The problem of innocent white subjects being searched purely for statistical reasons, in spite of not fitting any statistic pattern for terrorists Just for political correctness. That is a violation of their civil rights.